Oh, come on. It had to happen eventually. I had to cover one of the most controversial, bloodthirsty games of all time, the game that infuriated a whole generation of clueless parents. The game that pretty much invented the "Death Move", brought blood and guts to be standard fare in video games, and really kicked off what was just the beginning of increasingly violent digitised beat 'em-ups across all available formats. But no-one, except Midway, made decent ones. 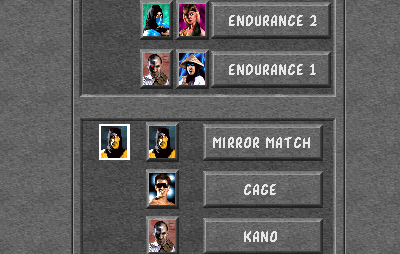 Pretenders all were the likes of Survival Arts, Street Fighter: The Movie, Time Killers (OK, not digitised, but riding on the crest of the violence wave), Kasumi Ninja, Way of the Warrior and Vicious Circle. 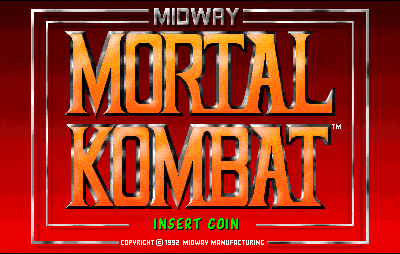 Mortal Kombat and its sequels seemed to be the only games of this type that really WORKED, that didn't come across as a gimmicky load of old tripe. Right, enough of this, let's dive in. The arcade version came along first; 7 characters, a fairly standard moveset for each (except for the specials, of course), and a back story that spawned a million (approx) fan stories and ran deeper than Advanced Lawnmower Simulator. 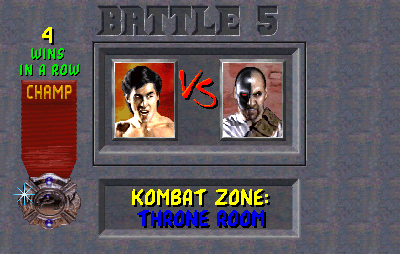 Let's touch on that quickly (it gets more and more complicated as the series expanded), basically there is the Earthrealm and the Outworld or some such place, where there exists a fighting tournament, which some guy called Shang Tsung has corrupted. Thanks to his meddling, there now exists a rule where 10 victories in a row for Outworld would result in the Earthrealm being overrun by Shao Khan's Outworld forces. How marvellous! So, the characters first of all: they're a varied bunch, a couple of Ninjas, the token Bruce Lee-alike, a God of Lightning, a film star, a mercenary and a woman. Each of them has the standard moveset, which is high and low punches and kicks as standard, the leg sweep, the big uppercut, the overhead throw and a roundhouse kick. Without special moves, each character would actually handle identically. But there ARE special moves, although usually only 2 or 3 per character. 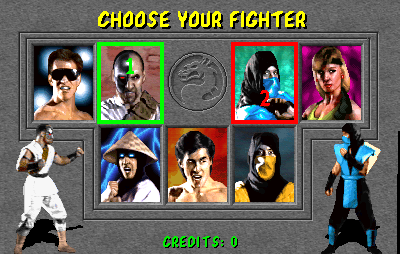 Johnny Cage, Liu Kang, Kano, Rayden and Sonya all have a "Fireball" move (ok, it might be lightning or a knife, but the effect is the same), whilst Scorpion and Sub-Zero have slightly different moves... Scorpion has a harpoon, which, on successful impact, he uses to drag the enemy in close, briefly dazed, for either a throw or an uppercut for best results. 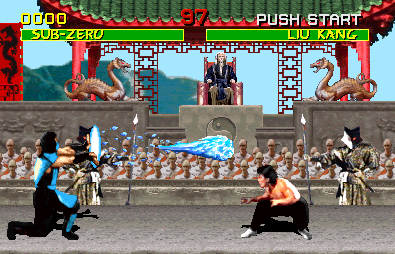 Sub-Zero uses an iceball, freezing the opponent on the spot, again with chance to get in close for a throw or an uppercut. Be careful, though, attempting to freeze an already frozen opponent will result in a "Double Ice Backfire". Oooh, nasty. Other special moves tend to be something like a "teleport" punch or kick variant, or Johnny Cage has the "Package Check" punch, which is good for a laugh. But the big part of the game was without doubt the fatalities. That's right, upon winning your second round, you were commanded to finish your opponent, a swift joystick combination from the correct place on the screen would result in some kind of bloodthirsty finishing move, which caused outrage in some anti-video game circles, but then again, so did most games, so maybe we can't pay too much attention to that. Your game would consist of beating each opponent in turn, then a "Mirror Match" against yourself, followed by 3 "Endurance" matches where you must beat 2 opponents. Then comes the big guy, Goro, a huge 4-armed half-human half-dragon who is not at all easy to beat, and then the final boss, the fireball-spamming Shang Tsung himself. Occasionally you'll be asked to "Test Your Might" against a variety of substances, starting with wood and going up to diamond, this little sub-game was a button-bashing frenzy to build up the power and strike. A nice little diversion, there. You know, I'm going to be brutally honest here... Without the death moves, Mortal Kombat would probably have never "made it", there wouldn't have been a sequel, there wouldn't have been a film, and there certainly wouldn't have been so much fuss about what is mostly a fairly "average" beat 'em-up. Hold on though, there is more... Y'see, Mortal Kombat was a sneaky and deceptive game, in that there were a few little tid-bits to deliberately keep surprises coming. First of all, on occasion a Green version of Scorpion and Sub-Zero would drop down before a match, give you a little bit of information, then jump away again... This was Reptile, and he was a hard-to-reach secret character. Once you got the clues, you then needed a little luck to find and face him anyway. 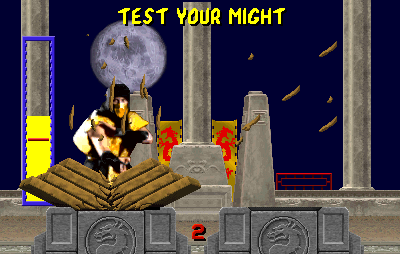 You needed to fight on the Pit stage, with shadows going across the moon (I seem to remember this was a 1-in-64 chance every time you reach the Pit level), win with 2 flawless victories, no blocking, and do your fatality. Until you find that Reptile is a faster enemy combining Scorpion AND Sub-Zero's special moves, which makes him very hard to beat. But still, word of mouth spread news of his existence. Another rumour was that of more hidden characters, such as Ermac, this was in fact just the name of a counter for "Error Macros". 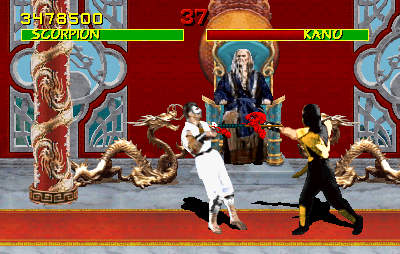 But still, it led to false counters being introduced in subsequent Mortal Kombat games in the future. But it was the death moves, the fatalities, that everyone wanted to see. 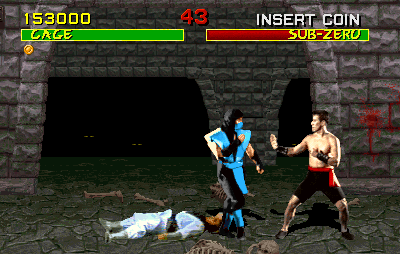 Still my personal favourite was Sub-Zero's Head-and-Spinal-Cord-Removal, though Kano's Heart-Rip was also good. 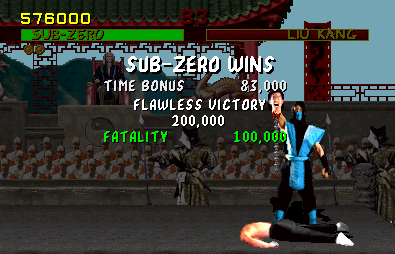 Liu Kang's was crap, though, basically a somersault kick and an uppercut, leaving no clue that the opponent was actually dead, except for the big "Fatality" bonus, that is. Uppercutting your opponent on the pit stage would cause them to fall onto a bed of spikes, ironically Reptile's lair, which was always nice. So, the arcade game was superb, how were the conversions handled? 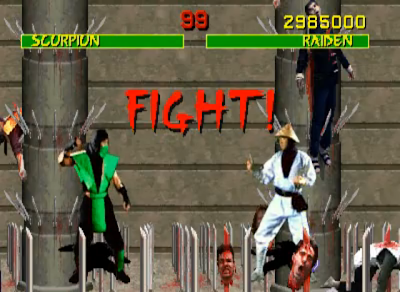 The SNES version was heavily censored, and removed blood (instead replaced with "Sweat") and changed several of the death moves to less "gruesome" moves. However, it still played really well, which is always a good thing. The Megadrive version started out with no blood, but had two codes to activate it again, which of course, everyone did. Despite some slight compromising on the graphics, it retained the speed and action of the arcade game, enough to compete with the SNES, so simply for the fact of the added gore, the Megadrive version just about trumps the SNES here, although you NEEDED a 6 button pad for complete control. The Amiga version was absolutely superb. It SHOULDN'T have worked, especially with only one fire button (I can't remember how it was done myself, but I promise you it worked perfectly), but the game was outstandingly good, and probably the most graphically impressive of all the 16-bit versions, but with disk loading times, and obviously getting used to the 1-button system, the Megadrive version would still win out, just about. However, the PC version was ARCADE PERFECT, except for the music which was probably better. Of course, you can just play it in MAME now, but without doubt, if you're going to find a home version, the PC is the one to go for. Although with it being DOS based, you might have a few problems here and there. The MK series got better, though, and even progressed into 3D, but the original game will always hold a special place in my heart. It's just a shame my heart is in Kano's hand and I'm on the floor. D'oh.